炎炎夏日，樂餉社(Feeding Hong Kong) 的義工們帶著大包小袋走訪了幾間麵包店後到達樂餉社的倉庫。 雖然汗流浹背，他們仍面帶笑容地掏出剛收集的不同型狀、不同味道的麵包、三文治或沙律等，互相分享著剛剛滿載而歸的經歷。 麵包的微溫好像正反映義工們的熱心；芳香四溢彷彿在給予他們一點點鼓勵。 另一邊廂作為義工的我每次眼見整張長桌被所收集的麵包、三文治及沙津等滿滿地攻陷，有時甚至彷彿堆了個麵包山時，不禁驚嘆香港不單浪費了如此多「有營」食物，也浪費了許多人力物力把這些食物送進堆填區。 食物不是用來填肚，而非用作填土嗎? 大家忙於為麵包山進行數點及分類，這只是冰山一角的數量。 Everyone is busy for counting and categorizing plenty of loaves in the“Bread Mountain”. The quantity is only the tip of an iceberg. 需冷藏的麵包等食物會作分開處理，以確保食物可安全食用。 Refrigerated items would be separated for speical handling in order to ensure they are safe to eat. 嗚謝樂餉社的義工及學習生事務經理盧小姐(圖右)接受我們是次訪問。 Acknowledge the help of Volunteer & Internship Manager Ms. Ivy Lo (right one) in this interview. 食物分類井井有條，快到期食品亦會放於此架上作優先處理及運送。Food categorization is well organised with this rack specially for prior handling and distribution of food soon to expire. 以防食物變壞，樂餉社的倉庫設有専業的冷凍設備。 For avoiding any food spoilage, Feeding Hong Kong is equipped with professional refrigeration facilities. 若星期二或星期四晚上未能抽空，也可向有賣剩餘的麵包店或食物供應商介紹樂餉社，將樂餉社的聯絡資料給予負責人，使更多有需要人士受惠。 若您是食品供應商的老闆或在職人士，亦可聯絡樂餉社安排收集剩餘的食品。 另外，樂餉社的倉庫也不定期需要人手作食物包裝及檢查等工序，有興趣可先上網登記以便樂餉社再作安排。 您仍要考慮參與不參與Bread Run嗎？ 但渴望很快在下次Bread Run見到您的我馬上要出動收麵包了! 再見! Feeding Tummy or Filling Land? Everyone knows the prevalent Bible story of five loaves two fishes feeding five thousands, but the five loaves refers to five loaves of bread instead of five biscuits in Chinese version. There are around 600 bakeries1 now throughout Hong Kong, that makes us wonder how many household can be fed indeed by surplus left from these bakeries every day? Every day thousands tonnes of bread or other leftovers are sent to landfills, so do we want to live on the “Bread Mountain” in future? Bread may seem to be an ordinary breakfast option or just a quick grab for filling our tummy, but with the high standard of living in Hong Kong, bread might be all affordable option for three meals for some grassroots. We surely should not look down on a tummy-feeding little loaf of bread, it can refuel energy for these grassroots to strive for their living while it is a staple food that provides sufficient nutrients for children, nurturing their growth. Under the boiling sun, volunteers of Feeding Hong Kong arrived the warehouse after visiting several bakeries with many big or small bags. Even they sweat like pigs, they still wore a smile when taking out different shapes and various flavours of bread, sandwiches or salads they just collected; sharing to each other their fresh experience in getting full of returns. The warmth of bread seemed reflecting the passion of the volunteers while the aroma diffused as if to give them some cheering. 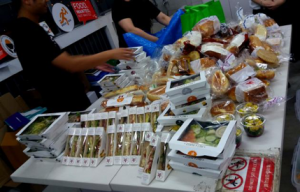 On the other hand as a volunteer, I saw the whole long table was occupied fully by bread, sandwiches or salad, sometimes even a bread mountain being built. 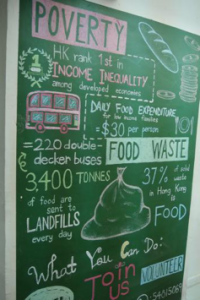 I am shocked that Hong Kong not only waste so much nutritious food, but also waste so many human resources or other resources to throw this surplus to landfills. Aren’t food are supposed to feed hungry tummies instead of filling the land? 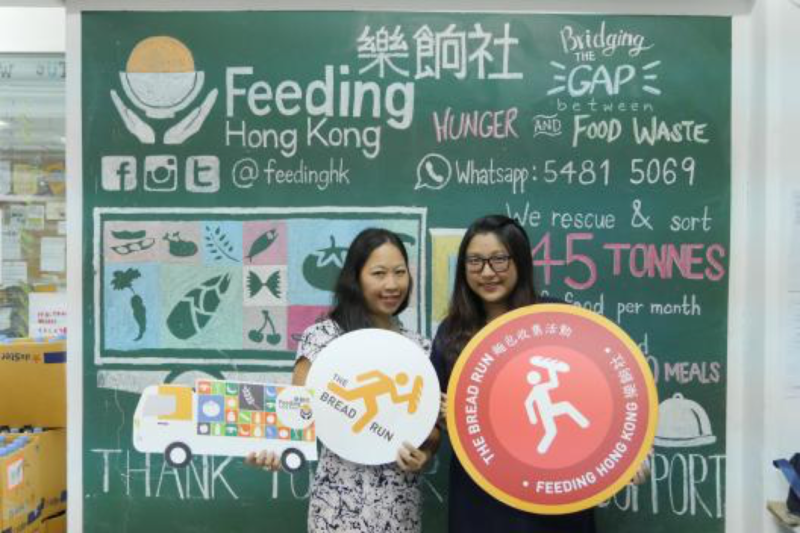 Feeding Hong Kong is the only food bank in Hong Kong recognized by the Global Food Bank Network (GFN), it has been offering opportunities for volunteers to chip their 20 cents in killing waste and hunger via bread-collecting campaign called Bread Run since 2012. Everytime it aims to feed around few hundreds of household, and reduce 800 to 1,200 loaves of bread or other leftovers jumping into landfills approximately. Except public holidays or typhoon no. 8, Bread Run is held every Tuesday and Thursday. About 71 charities including shelters, elderly homes or institutions, institutions that serve low-income group, new immigrants or minority families and schools with lower budget etc. are associating with Feeding Hong Kong now. Examples are Hong Fook Elder Home, Youth with a Mission, Home of Love, Christian Action, Fresh Fish Traders’ School etc.. Regarding parties sponsoring Feeding Hong Kong right now, there are more than 200 food suppliers, supermarket or chain stores, roughly 5% of these are bakeries or chain stores that support this campaign. Despite around 200 to 300 bread runners currently squeezing their time to help, there is still need for more stable ones to actively participate in the long run in order to avoid situation of no rescue of any available surplus. 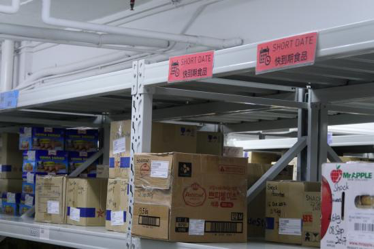 For ensuring food safety, bread or other surplus that arrives Feeding Hong Kong’s warehouse would stay overnight and being dispatched the next day to different charity organizations in need. 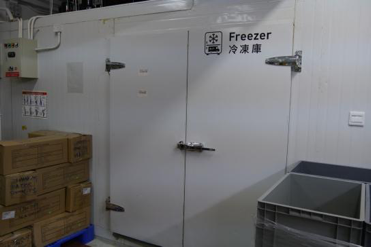 Apart from that, Feeding Hong Kong would immediately conduct temperature test on samples of refrigerated items among these newly arrivals (except test on the surface, they would also pin in the food with a thermo probe); making sure the benchmark of temperature both inside and outside are reached. In addition, staff of Feeding HK would also keep an eye on the transportation time, ensuring the fridged items would be arrived at their warehouse within 30 mins. The warehouse is also equipped with large-scale refrigerator and professional refrigeration facilities in order to avoid any perishment of the donated food. In case of any damage in the package or any spoiled or cooked food, Feeding Hong Kong definitely would not distribute it to any entity. Feeding Hong Kong would prioritize in handling and delivering these food to the collecting parties. Who wants to be a bread runner simply finish the mobile or online registration and pick any two or three bakeries or chain stores in 10 or more different districts. You can form a group with your friends to collect bread and sign up with one representative. For volunteer who are aged below 16 needs to be accompanied by either one of their parents or a guardian during the voluntary service. 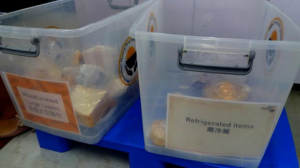 However for hygiene reason, volunteers are absolutely prohibited to take their cat or other pets in the Bread Run or enter Feeding Hong Kong’s warehouse. Prior to the run, prepare a few eco bags, call the selected bakery an hour before your visit to confirm if there are leftovers to collect; show the confirmation letter authorized by Feeding Hong Kong when you arrive the bakery, audit the quantities and types of collected items with the responsible staff, then transport them to Feeding Hong Kong warehouse or collection point3 for counting, weighting and categorization. Simple and convenient procedures, just free one night and pay a few visits with your legs, then you can do some exercise while devoting to charity at the same time, why not? If you are not available on Tuesday or Thursday nights, there are other volunteering opportunities like introducing Feeding Hong Kong to some bakeries or food suppliers which have leftovers and providing them contacts of Feeding Hong Kong, so that more needies could benefit. If you are the owner of or working in any food suppliers, you can reach Feeding Hong Kong for further arrangement in collecting your surplus. Moreover, the warehouse also has irregular demand in packing or checking goods, interested parties can register online first for further arrangement. To run or not to run, is it still a question for you? But I gotta run with the hope to see you soon in the next Bread Run! Bye! Data is according to the number of bakeries in 2016 Pleasant Environment Statistics conducted by the Food and Environmental Hygiene Department, HKSAR Government. For volunteers’ convenience, there would be one collection point in Central once a month now. Next 如何確保兒童健康成長?｜ How to Ensure Healthy Growth of a Child?